Some days ago I went to visit my friend who works as physiotherapist at “Ángel de la guarda” center for adults with cerebral palsy. I not only learnt more about her and work, but also about people with disabilities and, above all, life. If you have friends working in these places, or you have one close by, ask them if you can go and volunteer for them at least one day. If you don´t, find one. For the help you can provide. For all you can learn from them. For learning the value of many overlooked thing. For awareness. For integration. For them, but also for all of us, you included. This is post about my short visit there. Eli (a friend from childhood) works on a room full of balls, cushions, metal bar, stripes, colors, mirrors, anchors and strange machinery. Somewhere between a medical room, a mechanist, a kindergarden and a gym. She basically tries to stimulate the motor abilities of people with mental palsy so that they can learn to be as independent as possible. For example, in the picture above, Eli would sit someone in that position on the ball. Then she would push slightly to the sides, so the person has to compensate with the muscles of the abdomen and the back. 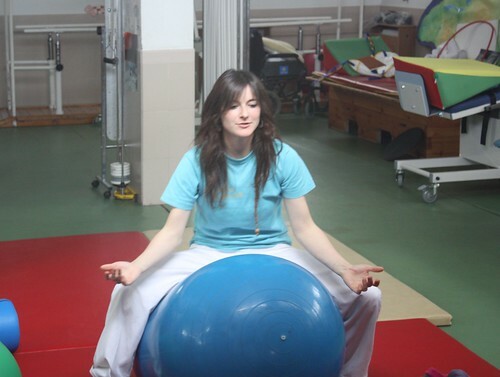 To do that correctly they not only need to exercise the muscles, but also the communication between the brain and the senses (may be that´s why she has a mirror, to get visual help of your position besides the equilibrium and the touch with the ground and the ball). The intricate link between mind and body is truly, and cruelly, exposed by the many ways it can fail. Then I went to see the other rooms where they learn manual and intellectual skills, adapted to their capabilities. Nowadays the goal is to do the best so they integrate in society as much as possible, being as independent as possible, not more. Years ago they were forgotten and secluded. Many of them could have had totally normal education and much normal lifes, but the society´s disability to integrate them was more acute than theirs. Look at that. Can you do it? I can´t. There are actually many other things from this visit that really shocked me. One of them was the Bliss language. It seems that sometimes the brain can work well and you can be very smart but, somehow, you can´t speak phonetic languages. I met someone that suffer from this. Nowadays she can already write and communicate using spanish (she even uses IM on the computer), but she had to learn Bliss. This is how she uses it. She carries with her a booklet with colored pages, pictures of people, places and such. Different colors are for different types of concepts ( e.g. verbs are red, or nouns are blue). She points to the sides of the pages so you can flip the pages until we get to the first word. Then she points to the symbol and you read the corresponding word which is written above it. Then she points to the sides of the pages again and next symbol for the next word. And so on until you get the phrase. Sometimes using the pictures to include cases like (my brother … ). She can´t talk but she can understand you. If she moves the hand up it means “me” or “yes”. Down means “no”. We spent like 10 minutes talking about her and her family, but I soon started to ask her about how the system works and the meaning of the symbols. For example love, friend, like or even hate are all very similar. They all have a heart and something else. It turns out that there are basic symbols and then modifiers for the symbols. For example, “hate” symbol is actually composed of 2 symbols. One for “contrary” and one for “love”. 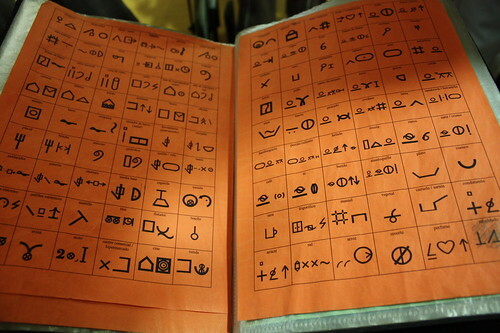 She has a list of basic symbols and modifiers on the beginning of the book, and she and Eli helped me understand some. While doing that it became extremely obvious that she is extremely intelligent, responsive to my questions and doubts (by raising energetically the hand, smiling or moving a lot). I was amazed by the complexity of the system, the ability to conjugate ideas and concepts. I also learnt that the symbols are universal, thereby allowing her to communicate with any other Blissymbol user in the world. At some point I mentioned, merely thinking aloud, that doing a “Blissymbol iPad app” would be fairly easy (conceptually) and I that I could already see many added benefits to such an app. She immediately raised the hand so high she jumped out the chair as a screaming equivalent to “YES please!”. Before leaving, I joined them for the afternoon of games. Once a month they play some competition game altogether. This time it was a race where they had to run in turns, take a ball with the color corresponding to their team, and trow it to a big bucket. Some could run alone, pick the right colored ball and trow it, some went walking alongside one of the instructors or myself, they choose the ball and then we threw it. For some we did the picking and trowing while we pulled them on their wheelchair. It was really fun to play with them. I discover they are all very competitive, but not towards others. They are competitive with themselves, to give their best and to have fun. Around 5pm, the buses and family came to pick them up. Then is also when you realize that for these families this kind of places are heaven. Having someone in your family with mental palsy mostly always means 200% full-time attention. Places like this one allows the families to carry on with other duties (like having a job!) while it provides a common place of support. Of great importance, those with handicaps maximize their capabilities and become as independent as possible. I made some other few photos, if you want to take a look. My final thought is to repeat the first one: If you have friends working in these places, or you have one close by, ask them if you can go and volunteer for them at least one day. If you don´t, find one. For the help you can provide. For all you can learn from them. For learning the value of many overlooked thing. For awareness. For integration. For them, but also for all of us, you included. Update: Please vote for them here.